NOTE: If using a BarrettHand equipped with a Force/Torque Sensor, BOTH jumpers in area C should be connected. This allows power to come through the side port of the BarrettHand and feed the Force/Torque Sensor through the bottom port. 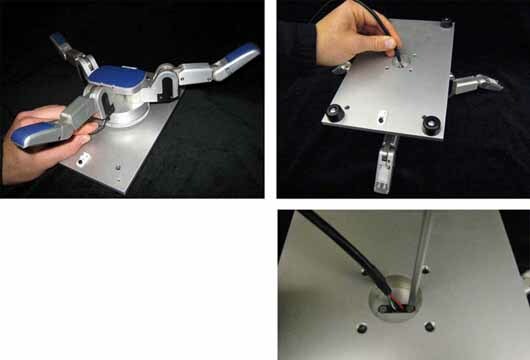 Like the Aluminum Bench Stand, the Robot Arm Adapter is made to secure the BarrettHand™ in place and to provide strain relief to the Hand cable. The Arm Adapter is fabricated for the tool-plate of your specific robot arm and is designed for low-profile, rigidity, and low weight. To mount your BarrettHand™ on a robot, bolt the arm adapter onto the tool-plate bolt circle located at the end tip of the robot arm. Fit the BarrettHand™ onto the projecting pins on the Robot-Arm Adapter, and secure the BarrettHand™ by threading the locking ring (included with your system) onto the base of the BarrettHand™. Note that, depending on the details of your robot arm, you may need to loosen the locking ring when installing the Hand cable in the next Section. All of the power and communications for the BarrettHand™ have been consolidated into a single high-durability robot cable which has an 11-pin bayonet-style connector at the Power Supply end and a tiny 10-pin Hirose connector at the Hand end. To accommodate the complex motions of a robot arm, the BarrettHand™ Hand Cable is extremely flexible and has been designed for compatibility with both internal and external mounting schemes. 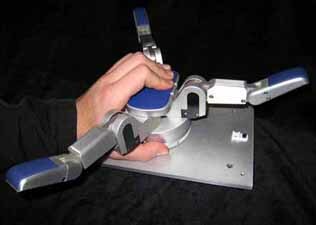 When a robot arm does provide an internal channel, the cross-section of the channel is tightly constrained. Therefore the Hand cable has been made with a particularly tiny connector at one end to ease internal installation. The base of the Hand Adaptor includes an opening to accommodate direct access from an internal cable to the back of the BarrettHand™. Attach the Power Supply Line Cord into any convenient outlet and verify that it is switched OFF. Attach one end of the Hand Cable to the Power Supply and the other end into the Hand. Tighten the strain-relief screws using the Phillips screwdriver provided in the toolkit. Check the switches on the bottom of the hand under the access panel. For CAN operation, make sure the CAN termination is ON (SW1, #4), SW3 is set to CAN (the side with the dot), and J35/J36 is correct for which port you are using (jumper on J36 for bottom connector).